Manila, Philippines - Weather bureau PAGASA released on Tuesday night, June 10, 2014 an update for 'Bagyong Ester'. 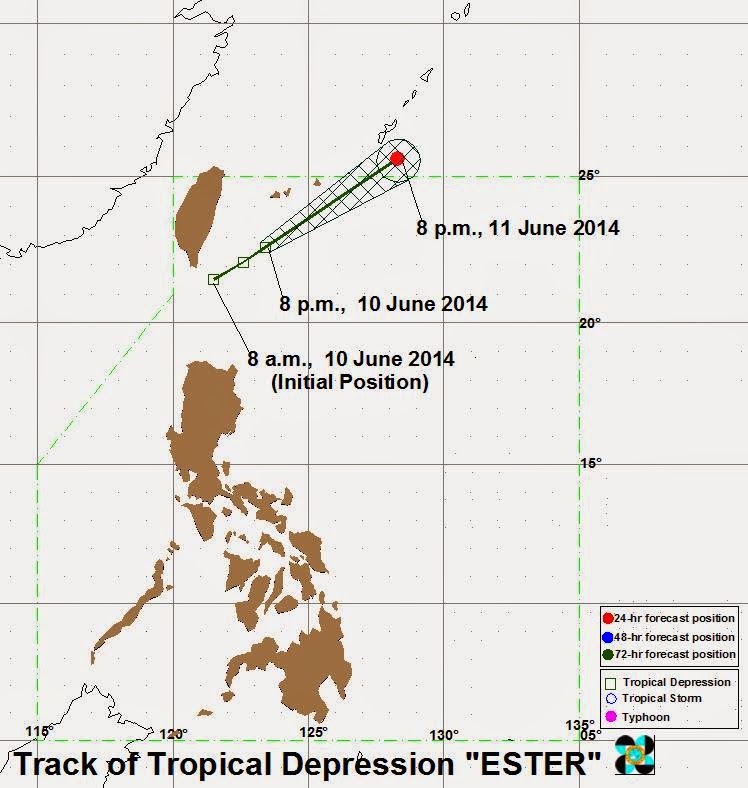 PAGASA said that 'Ester' has maintained its strength as it moves away from the country. The location of eye of Tropical Depression “Ester” at 10:00 PM today was estimated based on satellite and surface data at 270 km North Northeast of Basco, Batanes (22.7°N, 123.5°E). Tropical Depression “Ester” has maximum wind strength of 55 kph near the center. It is forecast to move Northeast at 22 kph. Tropical Depression “Ester” is expected to be outside the Philippine Area of Responsibility (PAR) by tomorrow afternoon (June 11) and at 750 km Northeast of Basco, Batanes tomorrow evening. PAGASA announced that Public Storm Warning Signal #1 is now lowered. Estimated rainfall amount is from 5 – 15 mm/hr within the 250 km diameter of the depression. "Ester” will continue to enhance the Southwest Monsoon which will bring moderate to heavy rains over Batanes group of Islands, Calayan and Babuyan group of Islands, Ilocos Region, Central Luzon and Metro Manila while the rest of Luzon will have occasional rains. The public and the disaster coordinating councils concerned are advised to take appropriate actions and watch for the next bulletin.